The producer's producer who has released for everyone from Big Dada, 4th & Broadway, 2000 Black, Talkin' Loud and Goya and whose 2008 Japan only album 'Zen Badizm' has had music freaks from all walks of life going crazy for its geniusly conceived deep-afro-broken-funk; IG (also recording as New Sector Movements amongst myriad monikers) is not only West London's foremost broken beat pioneer but a cross-discipline multi-genre experimentalist dedicating his whole life to bass heavy productions and whose formation and participation in London's now legendary Co-Op club has made him one of the most sought after DJs around. It will be his first time out in Greece and he'll be delivering an across the board set of all the most essential broken, hip-hop, afro, dub, soul and more. 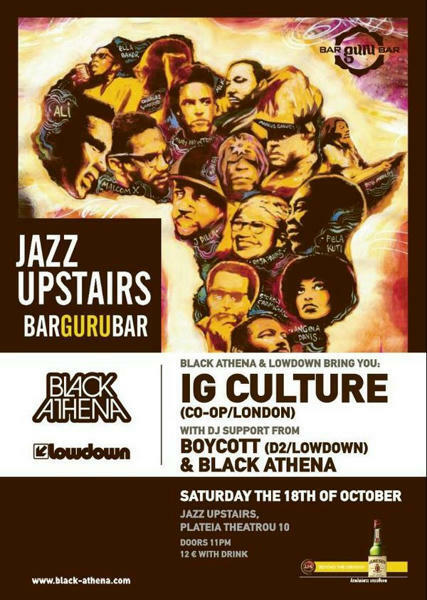 The event takes place at Jazz Upstairs (Guru) and support on the night comes from Black Athena and Boycott (d2/Lowdown). Listen to Black Athena live every Saturday & Sunday, 1-3pm on Athens International Radio 104.4FM or via: www.air1044fm.gr & www.athina984fm.gr. Once again it’s been a couple of months since we’ve updated you with our comings and goings so we've got a lot to pack in to our irregular bulletin but first we must kick off by giving some love back to all of you who’ve supported us over the summer! From those of you who came to the festivals, to the random summer parties, who got in touch during the show and who made guest appearances for us – thank you one and all! And of course thank you to everyone who showed their face at the opening bash of the season for the Outro ladies down at Yoga Bala on Friday – it was an excellent start to the ‘winter’ period for us so we hoped you all enjoyed the music and the party as much as we did. We’ve also got some upcoming dates for your diary – 3 events for now (and something secret and special coming up in November! ), each on a very different tip starting with next Wednesday’s inaugural ’100 bpm @ K44’ in which we’re taking things down an alternative pathway for a midweeker typified by off kilter Wonky sounds alongside crunked up synthy hype, leftfield (with a small ’L’) noises and steppy clutter the whole night long - think Bristol, think Glasgow, think "Los Angeles" and you’re thinking on the right lines... Free to get in as ever and a 10 O’clock-ish start; following that on Friday the 3rd of October we're extremely excited to be co-hosting PPP (AKA Platinum Pied Pipers), playing live for the first time in Athens on a night that also features handpicked DJs from the soul-jazz-hip hop cognoscenti of Athens across two floors for a party set to go on all night long, with the band playing live upstairs at the night’s climax. That takes place at Soul Stereo, is free to get in and kicks off at around 11. Finally on the 18th of October, something we’ve been trying to arrange for a long time – the Godlike IG Culture will be gracing these shores for an appearance at the lovely Jazz Upstairs, hosted by us and the Lowdown boys and with DJ support from the two collectives (Black Athena on a mellow warm up tip and Boycott bringing the house sounds after the guest). We’re very excited to be doing this particular event at the fabulous Jazz Upstairs and on their heavy sound system so want to give you all a bit of a long range heads up on this so you can be ready from now – anyone who’s seen IG do his thing at the legendary Co-Op over the years will know this is not to be missed. As always you can catch Black Athena's twice-weekly radio broadcasts on Athens International Radio 104.4 FM, every Saturday and Sunday afternoon 1pm-3pm (Greek time: GMT +2); the show can also be heard worldwide by going to www.athina984fm.gr or www.air1044fm.gr then clicking on the streaming logo in the top right hand corner of the page. The show is not currently archived (coming soon though!) so for now be sure to catch it live. Regular listeners know the show is dedicated to the best underground music around, be it brand new beats or rare grooves dug from the crates and also functions as a stage to hear what's being produced on the Athens' underground. On that note we are producing a particular segment of the show called Platform in which we want to showcase the music being made and played around Athens or further a field and are keen to hear your mixes and demos. As ever anyone who'd like to be considered for Platform can email us to find out more: (black-athena@hotmail.com). Recent Platform features have included some excellent guest mixes from the likes of AFTA-1, Thomey Bors, Fabrice Lig, J Melik and Boycott (d2/Lowdown) - a mixture of international guests and local heroes who’ve all bought their own unique flavours to the show. Black Athena also broadcast monthly from Italy's Radio Pellenera and Singapore's Dance & Soul. The newest installment of Black Athena's show, Black Athena FM, will be available on demand in the next few days at both (www.danceandsoul.com) & (www.radiopellenera.com) and will feature beautiful music from Nas, Black Spade, Finale and Yaw amongst others and also includes part of an interview we conducted with rising star Afta-1. It's a little earlier this year than usual due to the dates for Synch, but either way it's that time once again for a birthday party – Black Athena's to be precise – we are 3 this summer and to celebrate are bringing one of the hottest up and coming producers that the UK has spat out in the last year – Manchester based Trus'me (Prime Numbers) who with his debut 12” for the cooler than thou Stilove4music label out of Chicago, garnered the rapturous praise of house heavy weights from across the pond including the godlike Kenny Dixon Jnr. as well as Europe's own pantheon of underground music aficionados (Jazzanova, Mad Mats, Ashley Beedle, Gilles Peterson etc…). As you can guess we are super-excited about this so hope as many of you as possible can come out in support on the night, as well as to hear the fine sounds of Manchester's most precocious production talent, and Europe's own answer to the Detroit massive. We'll be there in musical support too so expect a night end to end with deep and heavy black musical flavours – future soul, hip hop, disco, Detroit... it’ll all be there. The party takes place on Saturday the 17th of May at Yoga Bala in Psirri and as ever is hosted by Outro. ...and a big thank you to the Greece is for Lovers crew for the beautiful flyer! The collective who've been bringing the vibes at parties around the capital for the last years are very proud to announce a special evening taking place at One Happy Cloud dedicated to the best in underground black music with two very special guests at the controls: BBC1Xtra's Benji B, and up and coming Greek producer Thomey Bors who together will be taking the crowd on a journey through hip hop, future soul, broken beats, nu jazz, deep house and Detroit techno. You cannot miss this. For those who attended last year's road blocked event at Black Athena's birthday bash where Benji B made his debut on Greek shores you'll know what this man is all about: future music woven together seamlessly with a head nodding beat and an ever present ear for melody. Benji's name is synonymous in music circles as a tastemaker, a DJs DJ, one of the best radio producer's in the UK and most recently a promoter of one of London's best club nights, his own monthly Deviation session which has featured guests as diverse as Flying Lotus, Eric Lau, Dego (4 Hero), Waajeed (PPP) and more. Benji has also shared bills with Theo Parrish, Steve Spacek, Skream and Madlib, and is currently winging his way round the Miami Music Conference with guest appearances lined up alongside Kevin Saunderson, Ron Trent, Benga, DJ Spinna and Daz I Kue to name just a few, before making a stop here in Athens. He has also travelled the world guesting at the biggest music events you care to name, from the Big Chill and Southport in the UK, to Barcelona’s Sonar festival, and to all of the world's biggest musical capitals, be it to hang with the Rush Hour crew in Amsterdam, to hold it down with the Stones Throw massive in California or to go deep with Tokyo's Jazzy Sport heads. A true home grown talent, Thomey Bors is a superlatively gifted producer of Greece's very own; having honed his DJing skills experimenting with sounds as diverse as drum'n'bass, Detroit techno, experimental electronica, hip hop, soul and more he turned his talents to producing his own beats and the results have had heads turning and ears pricking up in Greece's underground scene. Having received a full playback of his debut EP on Black Athena's FM radio show, and contributing a highly praised set at the STFU festival Thomey now opens proceedings for one of the mentors of his art. We want to announce a very special event that we're hosting this coming Friday night at Soul Stereo in Psirri; the night is called the True Soul Sessions and we'll be giving you soul from the past, the present and the future, from the sweet soul music of Marvin & Barry to the sample steeped soul of Dilla and Madlib, the psyched out stylings of Spacek or Badu, the refried soul that Moodymann and Theo do so well and the best of the rest of this deep and classic axis. Music is Everything... and there’s no music without Soul. March the 1st sees a very special happening taking place as part of the monthly Black Athena night as US DJ, re-mixer and re-editor Prince Language will be joining us on the decks. As ever Black Athena will provide blissful beats and melodies from across the board including Future Soul, Hip-Hop, Deep Funk, Disco, Reggae, Detroit Techno & Jazz, while Prince Language will be bringing his eclectic take on anything and everything as showcased in his highly respected No Comprendo mixes (check out www.thenocomprendo.com for more info). Be sure to arrive early as it's set to be a roadblock! Yoga Bala, 5-7 Riga Palamidou, Psirri, Athens . James 'Dilla' Yancey, 1974-2006, R.I.P. Black Athena start the New Year in the way they mean to go on by kicking off 2008’s party proceedings this Saturday (January the 26th), representing the length and breadth of black music. Expect Future Soul, Hip-Hop, Deep Funk, Disco, Reggae, Detroit Techno & a little bit of Jazz. First up we need to tell you about our monthly party taking place in our usual venue, Yoga Bala in Psirri, this Saturday night (December the 1st) hosted as always by Outro. As ever expect a blend of blissful beats and melodies from across the board including Future Soul, Hip-Hop, Deep Funk, Disco, Reggae, Detroit Techno & Jazz. Be sure to arrive early as it's set to be a roadblock and Black Athena will be packing in the musical treats from beginning to end. Yoga Bala, 5-7 Riga Palamidou, Psirri, Athens. The regular Black Athena party will take place on Friday the 26th of October at Yoga Bala in Psirri and as always is not to be missed! Expect the usual mix of: Future Soul, Hip-Hop, Deep Funk, Disco, Reggae, Detroit Techno & Jazz. Then on Saturday the 27th of October Black Athena present the highly anticipated double act of re-edits master Lee Douglas (Rong Music, NYC) & Andrew Lovefingers (Black Disco, L.A.) who will be winging their way to Athens to grace the decks of the newly revamped One Happy Cloud in Psirri. Expect soulful and psychedelic sounds spanning the entirety of disco, Balearic, funk, cosmic, re-edits, bootlegs and more. Entrance is free and the warm up comes courtesy of DJ Alexees (Boogie Dub Social Club/Urban Disco). Saturday the 8th of September saw Black Athena playing the opening weekend of the new season with a deep and soulful session at Yoga Bala in Psiri, hosted as ever by Outro. The night was huge fun as always and the resident DJs showcased all the gems they'd picked up over the summer to an appreciative crowd. The next Black Athena party will take place on Friday the 26th of October at Yoga Bala in Psiri and as always is not to be missed! The October date also coincides with Breast Cancer Awareness Day so Black Athena will be turning Pink for the occasion in an effort to raise money for the worthy cause. Yoga Bala, 5-7 Riga Palamidou St , Psiri, Athens . The 22nd of September saw the long awaited live appearance in Athens by legendary rapper Kool Keith alongside his longtime collaborator and producer KutMasta Kurt and the renowned MC Motion Man. The event was a roadblock and everyone who made it down on the night seemed more than happy with the show that greeted them; highlights included the back to back versions of Blue Flowers, and Kurt's incredible skills on the decks. The Athens International Film Festival has also opened its doors for another year and promises to keep audiences at the cutting edge of contemporary cinema. Black Athena were lucky enough to attend the Mel Cheren tribute documentary 'The Godfather of Disco' last Friday and can't recommend it highly enough. Coming up this week a documentary about Arthur Lee, the Blaxploitation classic Coffy and Michael Moore's new documentary 'Sicko' all promise to enthrall audiences. Saturday the 30th of June was an extremely special night for Black Athena: Benji B (BBC 1 Xtra/Deviation) graced the decks of Yoga Bala to help us celebrate Black Athena’s second birthday. Benji was totally on the ball as always and totally rocked the place from start to finish! We would like to thank all of you who came down on the night and everyone for your support these two years; we promise to continue working hard to bring you all the best in aural pleasure! Keep On. The highlight of July came in the form of the Synch festival; the annual event, which has in the past hosted astonishing artists such as Theo Parrish and Underground Resistance. This year’s line up was equally mouthwatering and included Mark Ernestus and Tiki Man from Rhythm & Sound, Beppe Loda, Chateau Flight, Moxie, and Bill Laswell’s Methods of Defiance. Keep your eyes peeled for the fruits of some of Black Athena’s conversations with the leading lights of the weekend. Saturday the 30th of June sees one of Black Athena’s most anticipated events of the year in the form of our second birthday party, which coincides with Outro’s closing party in an event that is set to outshine all others with the inclusion of a very special guest from the UK - Benji B (BBC 1 Xtra/Deviation). A few days before on the 27th of June Peanut Butter Wolf will be making a unique one off appearance in An Club accompanied by Baron Zen. This week on Thursday the 21st of June and as part of the European Music Day 2007, Nostalgia 77 will be appearing live in Technopolis in Gazi, Athens. The first weekend in May went off with a bang when Mr. Daniel Wang graced Athens with his presence to take to the decks at Yoga Bala in Psiri. Daniel brought the party to Greece and provided us with one of the most blissful sets heard in this little corner of Europe, keeping a lively crowd on their toes until daybreak. Friday the 20th of April also saw an exclusive visit by Detroit legend Eddie "Flashin" Fowlkes who played a super-deep mix of Detroit gems past, present and future to the El Barrio punters before popping in to the Black Athena session the following night. The next Black Athena party will take place on Saturday the 26th of May at Yoga Bala in Psiri and as always is not to be missed! The May date will see resident DJs on a classic tip before the exclusive June Birthday party, which Black Athena can now confirm will take place on Saturday June the 30th and feature very special guest Benji B (BBC 1Xtra) playing exclusively for the first time in Greece. Saturday May the 5th also saw Black Athena’s introduction onto the Greek airwaves. You can catch the brand new radio show hosted by Athens International Radio 104.4 FM and produced by Black Athena every Saturday afternoon 1pm-3pm. The show is dedicated to the best underground music around, be it brand new beats or rare grooves dug from the crates and will also function as a platform to hear what’s being produced on the Athens’ underground with a particular focus on giving a voice to the non-Greek community. Black Athena will be representing once again at Yoga Bala in Psiri on Saturday night (April 21st). Those that can make it down should expect sounds and rhythms from the spectrum of black music - now and then. On the night the DJs play from 11 and of course there's no tariff on the door. Look forward to seeing you there. We would like to thank everyone that came down and showed support at our last Black Athena night at Yoga Bala. It was really exciting to see all of you down there having a good time! If you're still left wondering about some of the tracks aired on the night, check this month's Black Athena FM for some insight. The next Black Athena night at Yoga Bala is on Saturday the 31st of March and as always, it's going to be a roadblock! The beginning of March has been an interesting time in Athens as Friday the 9th and Saturday the 10th saw two amazing guest DJs in town. On Friday night Barrio played host to Slam Mode's Michael Cole who thrilled the crowds with a deep and atmospheric set, while on Saturday one of the most instrumental personas in Broken Beat, Dominic Stanton, AKA Domu made a special guest appearance at Yoga Bala, playing music from every conceivable genre of modern and classic dance music. In other news as well as our regular monthly shows at Dance & Soul, Black Athena are now also broadcasting from Italy's Radio Pellenera. The March installment of Black Athena's show, Black Athena FM, is now online at both (www.danceandsoul.com) & (www.radiopellenera.com) and features the blissful sounds of: Smokey Robinson - 'Quiet Storm', Temptations - '1990', Peven Everett - 'All My Life', Doris Norton - 'Norton Apple Software' and many more. Following Black Athena's exhilarating January session at Yoga Bala, highlight's of which included the Salsoul Orchestra's 'You're Just The Right Size' and Lesette Wilson's 'Caveman Boogie', the next Black Athena night at Yoga Bala will be held on Saturday the 24th of February with residents playing soulful underground sounds all night long. El Barrio, the newest addition to the underground Athens music scene, has another excellent Sunday session booked for this week, supported once again by Black Athena. The night has been newly named 'Workshop - The Collective Sound of Athens' and this week features scene stalwarts Dr.Vodkatini live, as well as DJ sets by Bomba/Energia. El Barrio is Athens' newest underground music venue and although only recently opened the club has already hosted one of the hottest producers and DJs of the moment, Karizma, and is now embarking on a regular Sunday session whose debut this Sunday will feature two of Black Athena's own collective of DJs, Tassos Apokremiotis and Petros AKA Just Landed Cosmic Kid, who play together on the night as Deep Jazz Experience. Jazznovation will also be playing live and will be on stage at 10pm. Saturday the 27th of January will see the Black Athena collective taking charge of the decks at the ground floor bar of Yoga Bala in Psirri once again. Expect soul, disco, reggae, hip-hop, jazz and beats. Black Athena celebrated the festive period by delivering a crowd-pleasing session at Yoga Bala, as ever hosted by Outro. Black Athena residents played all night long, into the small hours of Christmas Day. It was good to see you all down there and we certainly hope you enjoyed it as much as we did. Highlights of the night included: Arthur Verocai - 'No Boca Do Sol', Jaylib - 'The Red', Capricorn - 'I Need Love', a classic flashback in the form of FSOL – 'Papua New Guinea' and many more. Christmas Eve will see Black Athena delivering a festive Yoga Bala session in collaboration with Outro with Black Athena residents playing all night long, into the small hours of Christmas Day. Black Athena hope you'll come and kick off a merry Christmas with us from 11 onwards. October has been a busy month for the Black Athena collective, the 22nd saw us taking charge of the controls at the newly opened Lab 22 in Exarchia, while on the 28th we returned to Yoga Bala for another packed out Saturday night session, which was a stormer! On Sunday the 29th we were back at Lab 22 for a 'Day After' Session and because Sunday just wasn’t enough we did a session the following Thursday to round it all up! Friday 24th Of November, a Yoga Bala session in Collaboration with Outro, Black Athena residents all night long, we advise getting there early! Black Athena will also be playing at the PLATFORMA VIDEO film festival in early December. PLATFORMA is an international film festival held annually in Athens, aimed at promoting contemporary cinema and films created using video and new media. Now in its sixth year PLATFORMA VIDEO will be held from the 2nd to the 7th of December, 2006 at the Nixon Bar Cinema and Bios in Gazi. More info on Black Athena’s participation will follow. Thursday the 7th of September will see the Black Athena collective taking charge of the decks at the ground floor bar of Yoga Bala in Psiri, for the first of a series of parties to kick off the new season after the calm of August. Black Athena hope to see our usual crowd down there and will be bringing the sweet music from 11pm onwards on the night. Entrance is free. This month English Deejay Carlos Slazenger (while currently holed up in Athens) posts a one hour set of 1950s and 60s horror rock'n'roll. These novelty songs are from the era of crazy exploitation rockabilly made by mostly one off groups to cash in on the teenage horror movie craze that began with television broadcasts of 1930s horror films. Carlos Slazenger has produced programs for Resonance FM in London and regularly plays live as part of DJ team Non-Stop Hits, and solo. Disillusioned by bland mainstream pop and supposedly alternative indie groups he trawls the junk shops and markets for unusual music to add to his collection of outsider and incredibly strange rock'n'roll. Carlos will next be plying his unique wears on Resonance FM on the 15th of August 2006 at 1900 BST. The July installment of Black Athena's monthly radio show, Black Athena FM will be online until August 15th, courtesy of the Dance & Soul crew (www.danceandsoul.com), if you haven't checked it out, here's your chance. Highlights of this July's show included: Mary Lou Williams - 'One', Aloe Blacc - 'Liquid Love', Roy Hargrove - 'Crazy Race' and Alton Miller - 'Clouds are Gone'. The next installment will be with you mid-month so don't forget to check back. The 14th of July saw the Black Athena collective taking charge of the decks at bar Open, for a follow up to their first birthday party back in June. Again we would like to thank everybody that came down and helped make it another night to remember. Aside from the Black Athena regulars, our special guest for the night was DJ Vags who impressed once more with his synthetic disco beats and his trademark cosmic influences. The main musical event of note this coming month is of course Greece's answer to Sonar, the Synch festival, which is held in Lavrio on 8th and 9th July. This year looks to be a first-rate celebration of underground dance with Black Athena particularly looking forward to Galaxy 2 Galaxy and remixer of the moment, Henrik Schwarz. Aside from all the Black Athena fun June also saw a visit to Athens by man of the moment Dixon from Sonar Kollektiv. His June 23rd appearance at Psirri's One Happy Cloud was seminal and definitely counts as one of the events of the year. June 21st was another big day in Black Athena's summer calendar as Black Athena Sound System took to the stage at the European Music Day Festival, in Thissio. Black Athena played an incendiary set fusing Black Musical tradition past and present to a curious gathering of onlookers, with live spoken word additions from Black Athena's resident words man Steve. A big thank you to everyone who made our first birthday party go off with a bang! The night was a huge success and individual contributions from all the DJs, musicians, visual and culinary experts combined to create a fabulous night. June the 21st sees the Black Athena Sound System taking to the stage at the European Music Day Festival, which takes place at various locations around the city. Black Athena will be fusing Black Musical tradition past and present with Urban/Ancient Athenian surroundings. Expect music, movies and more. For more Info please check: www.musicday.gr and our site at: www.black-athena.com. June is turning into a busy month for all of us here at Black Athena. The first date for your diaries will be our one-year anniversary birthday party, to be held on June 9th in a brand new bar, situated right in the center of town in Syntagma, which has the rather unusual name: ‘Open Sky with a Bird and a Parrot by the Square’! The usual Black Athena residents Costis, Jo, Petros and Tasos will be joined on the night by Athenian persona DJ Idolos for a special CDJ – live Trumpet session, which should make it an unmissable occasion. Culinary experimentalists Funky Gourmet will also join forces with us on a mission of warming up your palette, with their ultra modern creations. You’re all welcome! Friday 9th of June/ Open Sky with a Bird and a Parrot by the Square /10, Othonos Str./ Metro - Syntagma. The May/June installment of Black Athena's monthly radio show, Black Athena FM is currently online courtesy of the Dance & Soul crew (www.danceandsoul.com). In the latest show we give listeners the chance to sample the so far unreleased project by The Concorde Loop Band entitled 'Feelosophy'. Other highlights of this month’s show include: Gil Scot Heron 'Peace go with you brother', Dudley Perkins 'Come Here My Dear', Hugh Masekela 'The Boy is Doin' it (Carl Craig Remix) ' as well as Greek 80’s electro rarity Jazzburger 'Set On Fire', Per cussion 'Don't Stop' and 94 East 'One Man Jam'. May’s musical highlights included an appearance by Bronx born DJ Antonio Ocasio for a one off session, in Black Athena's prior home 'One Happy Cloud’, whilst Friday the 12th of May also saw the appearance of Jurgen von Knoblauch, of Jazzanova at Moshi Moshi, Athens. May 4th brought a very special visitor to Athens - legendary New York jazz drummer Steve Reid along with the 'ensemble' that helped produce last year's 'Spiritwalker' album (Kieran Hebden AKA Fourtet), a work of mastery which combines electronic synthesis with straight ahead free jazz. Steve Reid cut his teeth drumming in a number of cult outfits including Sun Ra's Arkestra, and for Motown records and as such brings a rich heritage to this contemporary pairing which made the night one to remember. Black Athena had the chance to speak with the legendary drummer and the results of those conversations will be available on www.black-athena.com in the near future. The Years of Defiance: The Art of the 70's in Greece is the title, of the latest offering from the Greek Museum of Modern Art. The exhibition offers an insight into Greek modern art from '69 to '81. The period is particularly interesting since it coincides with the years of political unrest and the military dictatorship in Greece. Many works are heavily fuelled by the political dead end of the time, while others explore issues of the body, sexuality, mass culture and art itself. The exhibition is being held in the Athens Concert Hall (new wing) and ends on the 7th of May 06. The April installment of Black Athena's monthly radio show, Black Athena FM is currently online courtesy of the Dance & Soul crew (www.danceandsoul.com). The latest show introduces a brand new section entitled 'spiritually speaking'. Black Athena cohort Petros Malevris aka Just Landed Cosmic Kid, dives deep into his record box and reveals some excellent and hard to find spiritual jazz gems, for your ears only! Highlights include Horace Tapscott's 'Desert Fairy Princess', Jaman Quartet's 'Free Will', Nate Morgan's 'Mrafu' and many more. Thursday the 13th of April saw the re-appearance of Osunlade for an unpublicized, full moon special, in Black Athena's prior home 'One Happy Cloud'. It was good to see him in a more urban setting again, away from his newly adopted volcanic surroundings of Santorini! The March installment of Black Athena's monthly radio show, Black Athena FM is currently online courtesy of the Dance & Soul crew (www.danceandsoul.com). For those tuning in for the first time, the show mirrors the work Black Athena have been doing during the past few years through the Black Athena website and club nights and spans decades and genres of quality music. Check back mid April for the next installment. The first day of April saw Black Athena out and about at the annual Record Fair, which has just taken up residency at Technopolis in Gazi, Athens. Black Athena were in an anticipated minority against a barrage of rock behemoths but still managed to meet plenty of like-minded souls and a good day was had by all. Black Athena are in the process of forging some interesting collaborations with local fanzines and radio stations, more details of which will be announced as plans are finalized. The first of Black Athena’s new monthly radio show’s aired in February courtesy of the Dance & Soul crew (www.danceandsoul.com) and by all accounts went down a storm. The show mirrors the work Black Athena have been doing during the past few years through the Black Athena website and club nights and spans decades and genres of quality music. The February show is still online for those yet to catch it; while the show for March will have been recorded by the time you read these lines. So log on and enjoy! February also saw the return of the Black Athena Discotheque, with a guest set at 'Loop' on Saturday, February the 11th. The gathered throng were treated to classics including Cerrone’s Look For Love, Voyage’s Point Zero and Marta Acuna’s Dance, Dance, Dance as well as some Detroit rarities and other assorted gems. Thanks to those of you that came down and showed your support, keep checking the website for news of our next date. The saddest news of the last month came with the tragic death of Hip-Hop luminary J-Dilla who sadly passed away due to complications arising from the chronic autoimmune disorder Lupus. J-Dilla, born James Yancey, was just 32 years old however his life’s work already more than surpassed not only his contemporaries but also the legends of the Hip Hop scene. He was a founder member of Slum Village and worked with almost every other Hip-Hop artist of note including Kanye West, Madlib, A Tribe Called Quest and Common. Such was his commitment to music that J Dilla recorded the foundation for the current 45-minute instrumental album Donuts while hospitalized last year due to his condition. Tributes have poured in from his contemporaries, his idols, and his fans alike, and radio shows from the likes of Benji B have acknowledged the great man’s untimely passing with shows dedicated to his life’s works. Black-Athena would like to add our voice to the many in the global music community to say that he will be sadly missed but never forgotten. Black Athena are pleased to announce the commencing of a monthly radio show entitled 'Black Athena FM' courtesy of the Dance & Soul crew at www.danceandsoul.com. The show will reflect the work Black Athena have been doing during the past few years through the Black Athena website and club nights. So log on everybody and enjoy! February sees the return of the Black Athena Discotheque, with a guest set at 'Loop' on Saturday, February the 11th. Entrance is free and on the night Black Athena’s deep soul, disco and dubbed out sounds will be on the menu. Mikro Mousiko Theatro in Koukaki, Athens are hosting a cinematic tribute to Sun Ra comprising two nights over two weeks. Part I will be held on monday the 16th of January with the projection of John Coney's "Space Is The Place" (1974), while part II will be held the week after and features Phill Niblock's "The Magic Sun" (1968)and Robert Mugge's "A Joyful Noise" (1980). Projections commence at 21:30. Black Athena the club is relocating! We are currently in talks with several interesting venues and in the New Year will be revealing our new home for the next few months. There will also be a charity fund-raiser at the start of 2006, which everyone on the mailing list will be invited to attend. Black Athena (Discotheque)at "One Happy Cloud", 12 Aristofanous Str. Psiri, Athens. Another sunday session with guests DJ Tassos Apokremiotios and DJ Vags in the mix, doing it Black Athena stylee. "Space is the Place" on the screen was tripping out everyone at The Cloud. Highlights of the night included Directions "Busted Trees" Carl Craig's mix, Yam Who's "Wrap You Up" and Osunlade's "5th Dimention". Another Sunday session with a few faces which we haven't seen for a while coming down to join us. Highlights included Roy Ayer's "Holiday" (DJ Spinna Mix), Fonda Rae's "Touch", Airto's "Celebration Suite" and Bobby Mcferrin's "Turtle Shoes". Black Athena (Discotheque) at Caffeina, 6 Kiafas Str. Exarheia, Athens. Black Athena (Electronics) at Loop, 3 Plateia Agion Asomaton, Thiseio, Athens. Forthcoming residency in "One Happy Cloud" in Athens Psiri district soon t.b.c. Black Athena (Electronics) at Loop in Thiseio, Athens. Highlights included Steve Martin's "Smoking" as well as Ian Ardley's "Santorini" from the Greek Variations LP recently re-issued by Soul Brother. Black Athena (Discotheque) at Caffeina in Exarheia, Athens.